We use 100% Natural Habotai Silk in most of our products that are hand dyed. If you order a white undyed flag, you will see that natural silk is white but not bright white because it is not bleached; it is a natural fiber. We begin with natural white silk and use Fiber Reactive and other dyes to bring about colors and patterns that symbolize the message we want to convey. As you can see, hand dyed silks do not have the regularity of commercially dyed textiles. When two pieces of silk are hand dyed with the same dyes, they will still be different. 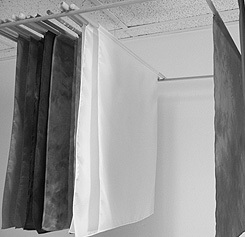 Silk dyers are generally pleased with naturally occurring variations and 'imperfections' in their work, such as dye specks, water spots, color separations, etc. The silk piece is considered more beautiful when it has a lot of 'action' going on. These unique markings give the silk its special appeal and are a sign that your item has been created by an artist's hand. Sometimes you will find your flags clinging because of static electricity. Silk and polysilk are especially vulnerable during cold, dry weather. We have found it safe to spray the flags with the product, Static Guard. We've even used Static Guard on the hand painted Praise Banners without a problem. The flags should not be saturated with the spray, which would be unnecessary. Just a light spray standing a few feet from the flag will work. There are a variety of effects that flags bring to worship. One is as weapons of war. How is a flag used in worship warfare? What real effect can it have in spiritual battle? How is it a weapon? Are flags symbolic swords? Following are a few answers to these questions. There were swords present in many ancient battles. According to Scripture, in spiritual warfare the sword is the word of God. "Out of his mouth proceeds a sharp, double-edged sword, that with it he should strike the nations." (Rev 19:15 WEB) "For the word of God is living and active, and sharper than any two-edged sword, piercing even to the dividing of soul and spirit, of both joints and marrow." (Heb 4:12 WEB) If your flag conveys a Scripture or its design and/or colors symbolize the Word of the Lord, in that way it could be considered a weapon of war like a spiritual sword. Although a worship flag can be thought of as a symbolic sword; practically speaking, it doesn't work well to use it like a real sword. Flags are made with lightweight and somewhat delicate fabrics so that they can float and wave. 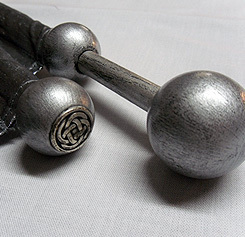 Actual swords are made of metal that can withstand violent use. Swords are brandished: Flags are waved. Definitions for wave imply smooth or continuous motion and graceful movement; whereas, brandish implies an aggressive manner as with a weapon or whip. "Let them praise his name in the dance! . . . May the high praises of God be in their mouths, and a two-edged sword in their hand." (Ps 149:3,7 WEB) "Their kings shall be terribly afraid . . . They shall shudder with terror when I brandish my sword before them." (Ez 32:10 ASV) To keep your flags in usable condition, it's best not to try to whip them around like an actual sword. "No disrespect should be shown to the flag of the United States of America." "The flag should never touch anything beneath it, such as the ground, the floor, water, or merchandise." "The flag should never be fastened, displayed, used, or stored in such a manner as to permit it to be easily torn, soiled, or damaged in any way." "The flag represents a living country and is itself considered a living thing. Therefore, the lapel flag pin being a replica, should be worn on the left lapel near the heart." All of the rules for the U.S. flag may not apply to worship flags, but we can learn from them. If it is proper protocol for earthly national flags to be treated respectfully, then similar and even greater respect is due to the flags of the Lord of heaven's armies. Thoughts on Classic style Worship Flags, Semi-circles with wood rods, and tall Praise Banners. Sometimes people will simply look more appropriate using flags in proportion to their bodies. A small flag in the hand of a six foot person can become lost; whereas, an extra large flag would look more suitable. We strongly suggest if you are not certain about the size you're thinking of buying, that you use a yardstick to lay out the measurements and get a good picture of the flag's size before you order. This will assure that you are satisfied with your purchase. Rectangular flags that are kept rolled around their rods for long periods of time tend to retain creases in the fabric that will wear through faster than necessary. We find that these flags are ideally stored hanging. 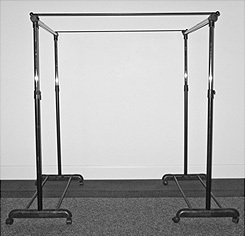 There are two types of flag racks we know of that are fairly inexpensive and easy to assemble. They work very well - and you can make them yourself. The first type stands on the floor and requires two ordinary clothes racks that can be purchased from stores that carry household items. It's important to find the kind where the height can be adjusted. The two racks stand parallel to each other and two metal rods, 3/8" X 40" (measurements don't need to be exact), are attached to the corners of the racks using black electrical tape. This makes a rectangular frame on which the flag rods can rest. (See pictures.) This rack requires the flags to be the same size. Extra large (32" X 38") flags fit perfectly (shown); and if one metal rod is moved inward, large (26" X 30") flags can fit. But all the flags, whatever the size, must have the same rod lengths. Metal rods can be purchased and cut to size at a hardware store. The rack shown in the pictures is being used in a church to service an expressive worship team. The second type of flag rack hangs from a dropped ceiling in this case. The plan can be adjusted to fit other types of ceilings. Four lengths of bendable wire are hung from the metal partitions in the ceiling, one for each end of two 3/8" X 36" wood dowel rods. Just wrap the wires around the rods a few inches from the ends and hang them from the ceiling parallel to each other. Space the dowel rods far enough apart so that the flags can rest cap end on one dowel rod and handle resting on the parallel dowel rod. (The picture shows unfinished flags; but finished flags will hang in the same way.) This rack also requires that all the flags be nearly the same size; but any size flag can be accommodated by simply moving one of the dowel rods closer or farther away from the other. 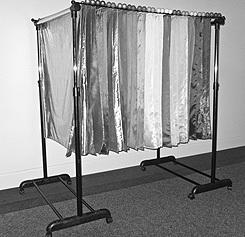 Multiple racks of this type would be needed to hold groups of same-sized flags.